Built to Support Any Application. ErectaStep metal ladders allow workers to safely access areas unfit for stairs. Our metal ladders are pre-engineered to save you time and money, and they join easily with the four other components to make up a complete ErectaStep stairs and work platform system. Freestanding ladders on job sites are inherently dangerous. According to OSHA, nearly 40 percent of reported workplace deaths in 2014 were due to falls. Because ErectaStep metal ladders are attached to a larger system, they’re more stable than freestanding ladders, so they can help prevent falls. These metal ladders can also serve as tower supports for adjoining work platforms, further increasing stability. 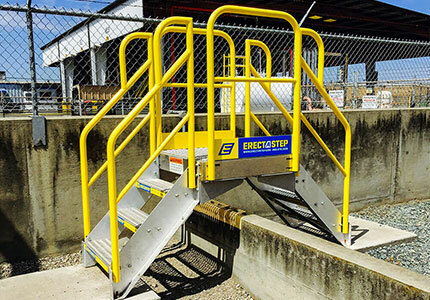 Always compliant, the top handrails of ErectaStep ladders are coated in ANSI yellow powder coating, adhering to OSHA’s health standards and increasing the product’s lifespan. As part of ErectaStep's five-component modular crossover system, your ladder can ship out to you the day after you order. All you need is the measurements of your workspace and we’ll walk you through the rest. Contact one of our experienced team members today to talk through your work platform needs. Shorter lead time. Because of their five standardized components and high-tech manufacturing process, ErectaStep can both ensure consistency and deliver the product to you quicker than ever before—so you can get it up and running fast. Lead time was important. We did not want to hold up our project waiting for the product to arrive. Our sales rep, Chris Hite, answered all questions in a timely manner and the product arrived in a reasonable time without any additional expediting fees. From the quoting process, right through to the delivery, and even a follow-up by customer service, to ensure that we, as the customer, we have been completely satisfied with our purchase from SafeRack. Built to last with not only quality, but safety in mind. The price was less, but the service was top dollar! End result, this product will last for years in our facility.